Sangria is a new favorite drink of mine. I’ve never been a big alcohol drinker, much preferring to waste my calories on something much sweeter that I could sink my teeth into! (Dessert anyone?) Then my love came home from a business trip to Spain and told me that he found the perfect drink for me. 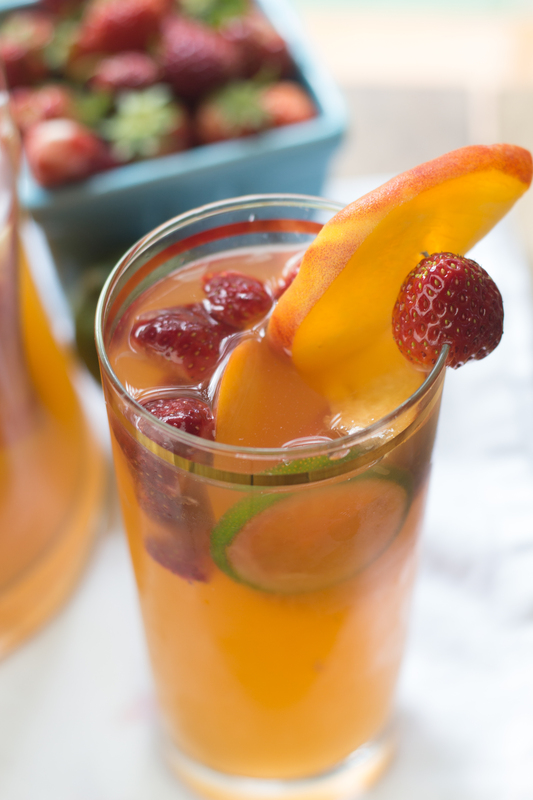 Fruity and sweet, this Peach, Strawberry & Lime Sangria really hits the spot. It’s like a dessert in a drink. Our strawberry patch is over flowing with strawberries at the moment, so I knew I wanted to make Sangria with the fruits from my garden. I decided to pair it with peach and lime, and worked from there. It ended up being more peach focused as that’s what was in my liquor cupboard. 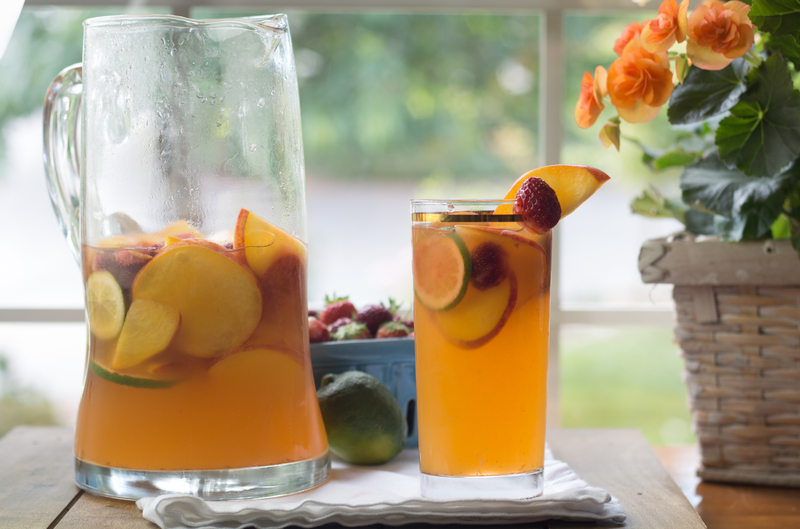 That’s the beauty of a Sangria. It always starts with a wine. You then add some liqueur and sometimes some juice. 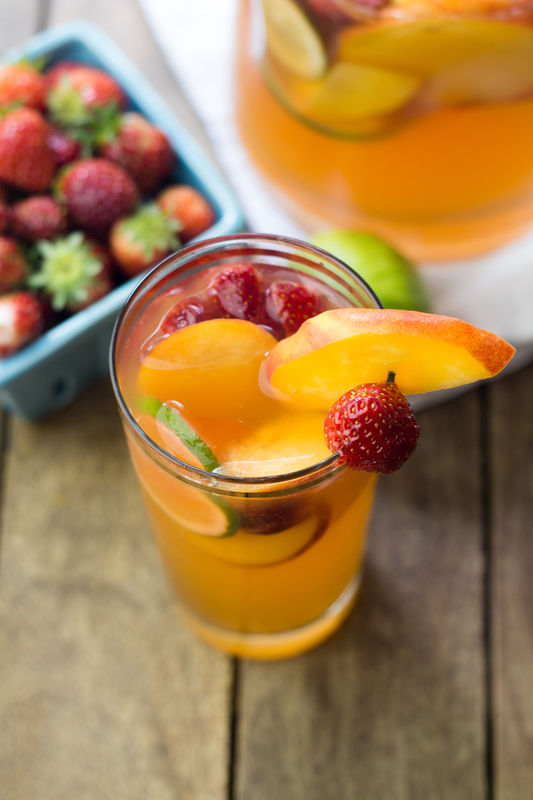 Depending on how sweet you like your Sangria, add some simple syrup (or lots if you like it really sweet!). Last of all you add some fruit. 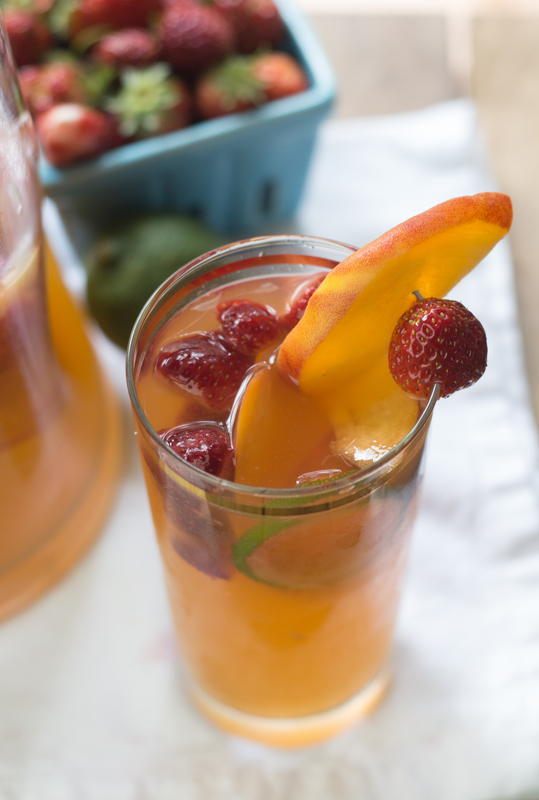 The Sangria then sits in the fridge to let those lovely fruits infuse the liquids. The formula is pretty much always the same, you just change the wines, liqueurs, juices and fruits to suit your tastes and desires. My love and I put the kids to bed, then sat out on our porch and drank this Sangria while we chatted the night away. But it’s also a fabulous party drink – one that you’re sure to impress everyone with how pretty it looks and how delicious it tastes! You could even cut the peaches into fun shapes for a little more fun! The recipe includes a recipe for simple syrup. Simple syrup is simply a combination of water and sugar, bought to a boil until the sugar dissolves. It makes more than what is called for in the Sangria, but I did this so that you could add more simple syrup if you wanted, for a sweeter taste. Combine the simple syrup, Moscato wine, peach liqueur, peach nectar and lime juice in a large pitcher. Gently stir together. Add more simple syrup if you want a sweeter taste. Add the peach slices, strawberries and lime slices. Chill in the refrigerator for at least 6 hours or overnight. Add the water and sugar to a small saucepan. Bring the syrup to a boil, stirring until the sugar has dissolved. Allow to cool.